The retail shelves have been telling us it’s time to celebrate the season since September, and now it’s finally time for the wine fun to begin! I’m often queried about several areas of planning and gifting during this time of year. Here are some tips to negotiate special occasions and special people in your life. How much wine should I purchase? Each 750ml bottle of sparkling wine can yield eight to ten servings depending on the stemware. Once the bubbles settle, the resting place for the serving is about half to three-quarters of the fluted glass. 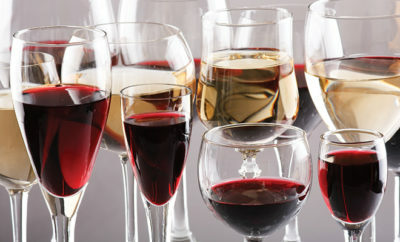 Each 750ml bottle of wine can provide five or six standard servings of wine. Depending on the stemware you use, a good rule of thumb is one-third of the glass per serving. The quantity of bottles needed depends on the type of event and other beverages provided during it. 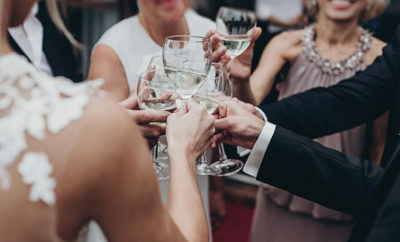 With a wedding, welcome receptions, post-ceremony cocktail hours, formal dinners and receptions all require special care in preparation. Generally, there are beer, wine and some cocktail service, which reduce how much wine you need to purchase. Folks who enjoy beer generally stick with beer for the duration of the event with the exception of a champagne toast which is usually only about two ounces. Hosting a dinner will generally include a welcome cocktail and appetizer before dinner and desserts are presented. Whether it’s in your home or at a more formal venue, gauging your guests’ preferences will be helpful if you’re in charge of arranging the wine. Wine is packaged by the case of 12 bottles; beer is packaged by 18 or 24 per case, depending on the beer. Do the wine math. For a wedding, 100 guests, 2 servings each, equals 200 servings divided by 12 cases, requiring 16.6 cases. For a dinner, 20 guests, 3 servings each, equals 60 servings divided by 12 cases, requiring 5 cases. If you have more wine lovers than beer lovers or vice versa, adjust your bottle counts to reflect their tastes. Considering this much volume, we want to ensure we’re happy with the remaining unopened bottles. During this time, I generally go with my 25/50/25 rule, which works out to 25 percent white wine including sparkling wine, 50 percent red wines including dessert wines, and 25 percent beer or cocktails. Stay with refreshing, versatile white varietals such as viognier, chenin blanc, marsanne and Riesling. Red wine selections can range from mild red blends similar to a Meritage to easy-drinking zinfandel or bold shiraz and cabernet varietals. 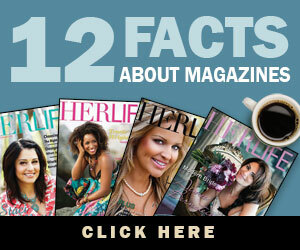 All will pair with the variety of menu offerings and the range of your guests’ wine palates. 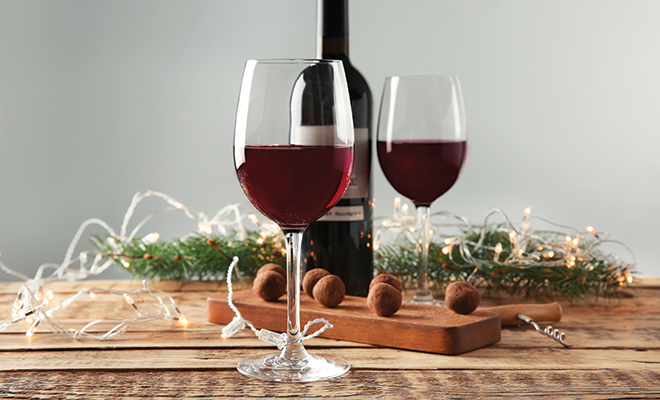 How do I prepare the holiday wine service? Adjust the shelves in your refrigerator to a narrow setting. Most shelves will permit six bottles to lay flat in this space for an even temperature. When one or two bottles are opened, replace them from left to right to keep track of next-up wines. If you have space, consider plugging in the college-dorm-sized mini-fridges in your garage for this occasion. Designating two large ice chests on the back porch or garage is just as simple. Place several unopened bags of ice along the bottom of the ice chest. Set the unopened white wine bottles upright in it to protect the labels. For red wine bottles, set only one bag of ice inside the ice chest and arrange bottles upright to capacity. Open and recork two of each varietal 15 to 20 minutes before guests arrive. Have a small bar-sized ice bucket or two at the service table to keep the current wine ready for service! What do you suggest for gifts? “Oh, I forgot about…” is a statement to avoid. Here are some quick, easy solutions to keep on hand at home or the office. – Wine books come in a variety of sizes, topics, wine quotes and wine regions of the world for the traveling spirit in all of us. – Wine charms come in groups of six that can be split up and tied to a gift with colorful ribbon. – Wine napkins and decor are always a thoughtful and inexpensive way to thank someone for inviting you to their home. – Holiday-themed stockings from the discount store to make great wine gift bags, cinched at the top with a little ribbon. – Wine certificates are a great way to take care of your gift-giving while enjoying the latest releases at your favorite winery. Your wine club may be offering special wine-pairing experiences or wine-sampling events that can be given as gifts. Be sure to check the expiration dates of these certificates to ensure they can be utilized timely. ← Previous Story Gifts of Taste for the Palate!